If you’re looking to change things up this Valentine’s Day, then we think paintball is an excellent option! Besides being great exercise, heaps of fun and a ‘date with a difference’, there are loads of other benefits too. Let’s take a look at the top five reasons you should break the mold and take your partner paintballing this Valentine’s Day. If you’re still in the early stages of your relationship, the last thing you want to do is overwhelm your partner (male or female) with a super-romantic Valentine’s Day that might make them feel you’re rushing things. Paintball gives you a chance to spend some quality time together without the pressure of having to come up with a million things to talk about over a candlelit dinner. This makes it an excellent option as a first date, especially if all you know about the person is that they enjoy sports or games. On the flipside, if you’ve been together for a long time, doing something unique and unfamiliar together gives you the chance to see a side of your partner you might not have met before! 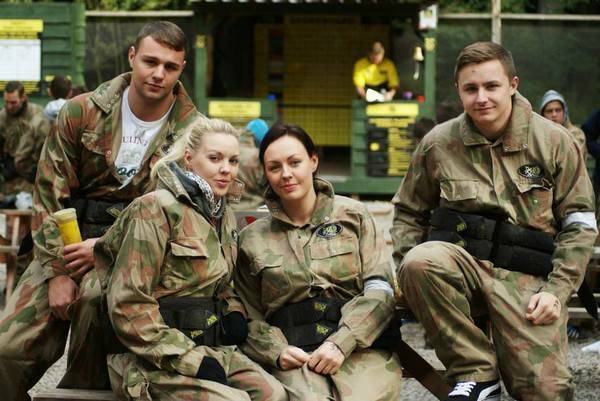 Paintball is a sneaky way to discover just how competitive your partner might actually be. Whether you’re playing on the same side or facing off as arch enemies during your paintball game, it’s always fun to get to know what kind of opponent your partner makes! It gives you a chance to express how impressed you are with them through praising their play and performance (even if you are exaggerating a bit!). If you play your cards right, there’s plenty of opportunity to earn some brownie points. If you find you’re actually quite good at it, then there’s the extra bonus that your partner is sure to be impressed by your performance too. It sparks interest to find out more about each other and explore other aspects of their personality too. Nothing’s quite as good as a blood pumping experience to get you in the mood for… well, other blood pumping activities! If you’re looking to start the evening off with a bang, then choosing an adventurous activity is a great way to set the tone for the rest of the night. Running around, diving for cover and shooting at targets all get the endorphins and the adrenalin flowing, making sure you and your partner are in a great mood for the rest of the night too. Setting a playful mood can help relax both of you and make conversation easier. Win or lose, you’ll be certain to have loads to talk about after your game! Sharing in a new experience together and making some awesome memories to associate with each other is a massive boost for any relationship, new or old. Because it’s also a great stress reliever, it helps you feel more relaxed around your potential partner and gets rid of any pre-date jitters you might have had. It also offers a great escape from reality and allows you both to become action heroes for the day. So again, take the opportunity to praise and congratulate your date on any moves, strategies or interesting gameplay they came up with! Seeing your partner in an unfamiliar situation is a huge opportunity to learn more about the hidden layers of their personality. They might turn out to be more strategic and tactical than you expected, more compassionate and empathetic, or possibly even really, really competitive! It will give you a better idea of how they prefer to tackle problems, deal with stress, and how confident they are in new situations. Now that you’ve got all the excuses you could possibly need to make paintballing your first date or your Valentine’s Day with a difference, there’s of course one other giant reason to consider it – it’s loads of fun! Click here to see how much does it cost. It’s different, exciting, adventurous, and even gives you the opportunity to be the hero or heroine of the night. If you’re looking for a way to really impress your date this year, then we highly recommend giving paintball a shot!